It's the monthly melange of Munchkin memoranda! We're still meshuggah over Moop's Monster Mashup . . . maybe you noticed. 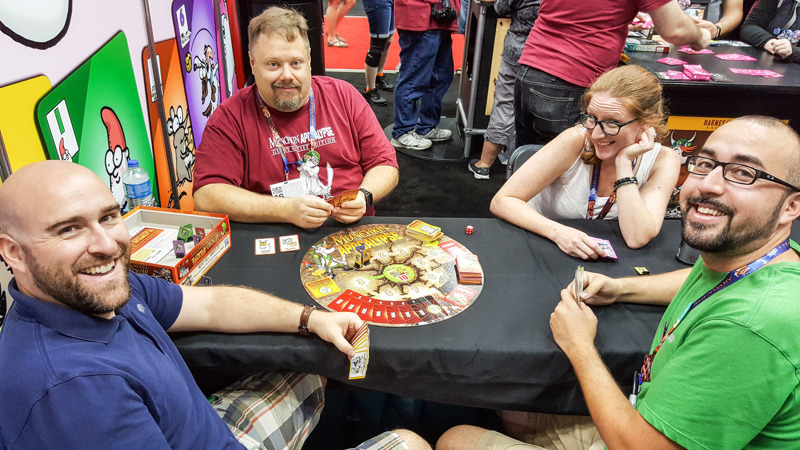 Thanks to everyone who visited us at Gen Con (especially the folks who made the Munchkin Tavern a success once again! ); we're already making big plans for Gen Con 50 next year! We made several announcements over that weekend, which you can read about in the August 15 Munchkin News. We also appreciate everyone who came to see us at Board Game Bash and those who attended our #PlayMunchkin events on August 13. Those were fun! We'll be looking at how to make them even better for next time. Remember that you can always look at our Conventions page to find out where we'll be next. Looking forward, we're in very good shape: everything through the first quarter of 2017 is already at print, which means we're working well over half a year ahead. Devin is hard at work on the Collectible Card Game, and our artists are turning in really fun illustrations. It's progressing nicely. We have some very cool new games and expansions coming next year, including the first of the new sets from our co-conspirators at USAopoly (the first draft of which is sitting on my desk as I type this – I wish I could tell you more, but you'll find out soon enough). Bit of a short update this month, but it's not for lack of new things coming . . . just no new things I can talk about. Maybe next month, I can be more forthcoming.